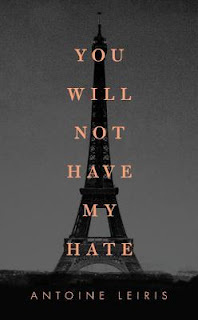 On 13 November 2015, Antoine Leiris’s wife, Hélène, was killed, along with 88 other people at the Bataclan Theatre in Paris, when three men armed with guns and suicide bombs opened fire on the unsuspecting crowd at a rock concert. Three days later, Leiris, a young journalist, wrote an open letter on Facebook addressed to his wife’s killers. Leiris refused to be cowed or to let his 17-month-old son’s life be defined by Hélène’s murder. He refused to let the killers have their way. ‘For as long as he lives, this little boy will insult you with his happiness and freedom,’ he wrote. Instantly, that short Facebook post caught fire. It was shared over two hundred thousand times and was reported on all over the world. In his beautiful and moving defiance of the terrorists who had killed his wife, Leiris became an international hero to everyone searching desperately for a way to deal with the horror of the attacks. 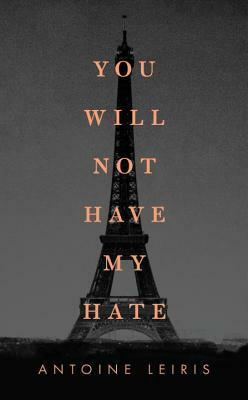 You Will Not Have My Hate is an extraordinary and heartbreaking memoir about how Leiris, and his baby son Melvil, endured after Hélène’s murder. With courage, moral acuity, and absolute emotional honesty, Leiris finds a way to answer the question, how can I go on? This is the rare and unforgettable testimony of a survivor, and a universal message of hope and resilience. Leiris is guiding star for us all in perilous times. There are no words to describe the beauty and pain so clearly demonstrated in this book. Leiris writes with such raw emotion and leaves the reader in a constant state of heartbreak. Even though there is so much pain in this novel, I enjoyed every single word. Leiris' love for his wife and child are clearly displayed in his exquisite writing. This novel is truly an unforgettable story and should be shared with all types of readers. Thousands of people read and shared Leiris' open letter on Facebook, but You Will Not Have My Hate digs deeper into the emotions and hardships that he endured and continues to endure. This is not a typical review because You Will Not Have My Hate is not a typical everyday story. I strongly encourage you to pick up this book and share it with someone after you finish reading. This is a story to be shared over and over again. Antoine Leiris, you have been strong, courageous, and inspiring during a horrific experience and I was honored to read your story. This sounds like a heartbreaker. Non typical books are what I need right now so I'm adding this to the TBR.